My hope this weekend was to get onto the computer, run some images through photoshop and update my current website www.brandonjosephbaker.com. Best laid plans and a wife intent on a speedy recovery (i don't blame her. that collar bone has been a pain in the neck for too long, pun intended). None the less after the fourth of july holiday i should have a batch of new images here and on my website for your viewing pleasure. If you're in San Francisco this week please pick up a copy of The Guardian and check out the center spread of SCENE, literally where the staples meet. It's not quite a center fold and not quite a double truck but there is some big play for my image! I have been working over the last 6 weeks on some new pieces for an art show on August 2. It's my first solo show at My Trick Pony, a gallery and custom graphic apparel store in San Francisco. 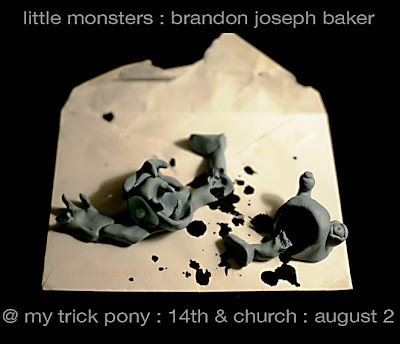 THE DETAILS: the show is on August 2 at My Trick Pony, 742 Fourteenth Street, SFCA. Arrive sometime after 7:30, drink some wine or Jameson, enjoy the gummy bears and Oreos and then buy a t-shirt or splurge on some limited edition art for your home.